What are the next steps for the DC PLUG Initiative? On March 4, the DCPSC turned 106 years old! We are proud to continue a legacy of equal opportunity, protecting and educating consumers, fostering energy conservation and efficiency. To learn more about the DCPSC's history and mission of serving the public interest, check out our history book, The First Hundred Years. it is filled with great historical pictures of the District. It also provides readers a greater understanding of the Commission's work and impact on District residents. Public Utility Fortnightly Magazine features the DCPSC in its March 2019 issue. The article celebrates the distinguished career of Betty Ann Kane and discusses the DCPSC’s new look and initiatives under the leadership of Chairman Willie L. Phillips. The DCPSC now allows electronic submission of confidential documents filed through the Commission’s website. The new feature will allow an eDocket user to file a single public document, a single confidential document, and/or a public and confidential document concurrently. Documents may be filed electronically 24 hours a day, 7 days a week. Each year, the DCPSC's Office of Consumer Services provides information on utility discount programs and energy efficiency tips at the Washington English Center, where training and resources are offered to immigrants in the greater D.C. area. Invite the DCPSC to your event or meeting by scheduling an outreach here or call 202-626-5120. DCPSC joins the National Association of Regulatory Utility Commissioners (NARUC) in promoting the U.S. Environmental Protection Agency's (EPA) WaterSense initiative. Click here to learn how to save water, energy and money all year long. District residents can provide input and recommendations about modernizing the District’s electric delivery system. Sign-up for the working group here. March 27, 2019 at 2:00 p.m.
Click to watch the live stream. March 27, 2019 10:00 a.m to 2:00 p.m.
5701 Georgia Avenue N.W. Join the DCPSC and other District agencies for a day of pampering our D.C. Seniors as well as informing them of resources. Need to file a complaint or have a question about your utility service? Contact the Office of Consumer Services at 202-626-5120. Subscribe to the DCPSC's Your Energy. Your Voice. Newsletter. Columbia Power Line Undergrounding (DC PLUG) initiative. DC PLUG is a joint effort between Pepco, the District of Columbia Department of Transportation, and other District agencies to improve the electric service reliability and reduce the impact of storm-related outages in the District, by placing select systems underground. For next steps, Pepco and DDOT are expected to begin construction this Spring in the American University Park and Friendship Heights communities. Congratulations to the DCPSC's Office of General Counsel and staff who contributed to this impressive win for the DCPSC. And a special thanks to General Counsel, Chris Lipscombe, and Attorney Advisors, Naza Shelley and Rick Herskovitz, who argued the case on behalf of the DCPSC. Visit the DCPSC website to keep current about DC PLUG. The DCPSC has received complaints from Pepco customers about receiving calls from individuals falsely claiming their electric service will be disconnected unless payment is made. Scammers are utilizing a tactic called “spoofing,” when a number different from the caller is displayed on the caller ID to make the consumer believe a utility or other entity is calling. Scammers are often requesting that a consumer buy a prepaid credit card or other means of cash payment to prevent disconnection of service. The DCPSC strongly advises District utility consumers against either making payments of any type over the phone to prevent a utility disconnection or providing any type of account or personal information to a caller. If someone threatens immediate disconnection or shutoff of service, customers should hang up the phone, delete the email, or shut the door. Customers with delinquent accounts will receive advance disconnection notification. A utility representative will never call you to ask you for cash or request that you purchase a prepaid credit card to make a payment on your bill. If you believe you have been the target of a scam, please contact the Commission’s Office of Consumer Services at 202-626-5120 to file a complaint. For more more tips on how to avoid utility scams, click here. 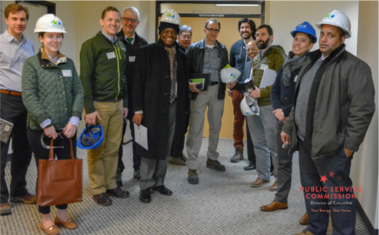 Five of the six MEDSIS (Modernizing the Energy Delivery System for Increased Sustainability) working groups met in February with stakeholders engaging in a range of topics addressing DC’s clean energy future. 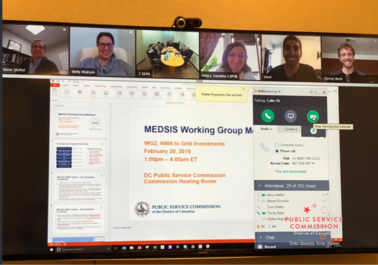 Despite a small snowstorm that closed District government for a day, the MEDSIS Pilot Projects and Non-Wires Alternatives (NWA) working groups held virtual meetings that were well attended. In fact, the NWA working group set a record for stakeholder attendance with 44 attendees that even included guest presentations from Betty Watson of Tesla, Nitzan Goldberger of ESA, and Ray Hohenstein of Fluence. The Pilot Projects working group debated a pilot scoring process, and the NWA working group discussed storage and distributed energy resources (DER) ownership models as well as a future distribution planning/ NWA proposal process. The Rate Design, Customer Impact, and Microgrid working groups also met in February addressing alternative rate designs and performance-based regulation, community engagement, and microgrid regulatory framework. The Data and Information Access and Alignment working group did not have a scheduled meeting in February and will resume its meetings in March. With the February meetings complete, all six working groups will start summarizing their activities to date and crafting recommendations for stakeholder review that will eventually feed each working group’s report to the Commission in May. Click here to read more about MEDSIS. District residents can still sign-up to participate in the MEDSIS Working Groups. 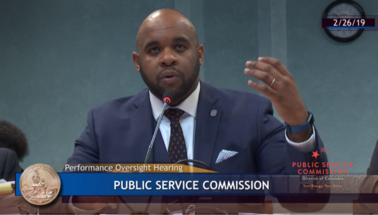 The DCPSC was proud to present to the D.C. Council’s Committee on Business and Economic Development its top priorities to better serve District residents. Chaired by Councilmember Kenyan R. McDuffie (Ward 5), the Committee reviews the Commission’s past performance, and its mission and vision for the immediate future. Chairman Willie L. Phillips, alongside fellow Commissioners Richard A. Beverly and Greer Johnson Gillis spoke of how the DCPSC is specifically focused on grid modernization and distributed energy resources (DERs), infrastructure projects, and community engagement. Other highlights of the testimony included announcing Commissioner Gillis’ oversight of the DC PLUG project, and Commissioner Beverly’s responsibility in reviewing, with a view toward streamlining, the rules and procedures of the DCPSC. To see the full video of testimony, click here. What is the Capital Grid Project? 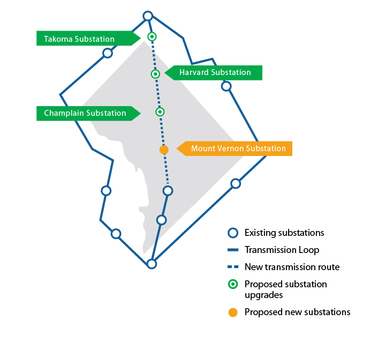 The Capital Grid Project, for which Pepco is seeking the DCPSC's approval, is a long-term plan that proposes to address multiple system needs: updating the aging infrastructure, enhancing resilience against transmission disruptions, increasing the reliability of downtown power supply, adding capacity in rapidly growing areas, and accommodating more customer-generated power. The proposed project involves: (1) rebuilding two existing substations that are 60 to 110 years old (Champlain and Harvard Substations, respectively); (2) replacement of aging underground cabling; (3) constructing 10 miles of new 230 kV underground transmission lines; and (4) constructing a new Mount Vernon substation, located at First and K Streets NW. Pepco filed a revised Notice of Construction (NOC) for the Capital Grid Project (Formal Case No. 1144), which is under consideration. The DCPSC must approve Pepco’s NOC before the company can start construction on the project. Click here to learn more about the proposed Capital Grid Project. Any individual engaging in the business of an electricity or natural gas supplier in the District of Columbia is required to take the DCPSC’s “Supplier Education Workshop and Test.” All current and new Electricity and Natural Gas Supplier licensees are required to take and complete the workshop and test by April 1, 2019. The workshop and test will educate and assess the suppliers understanding of the Utility Consumer Bill of Rights, the Electricity Supplier Rules and the Natural Gas Supplier Rules. 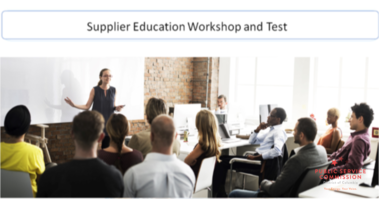 To participate in the workshop and test, visit Supplier Education Workshop. For questions about the Energy Supplier Education Workshop and Test, please contact Tiffany Frazier at tfrazier@psc.dc.gov. 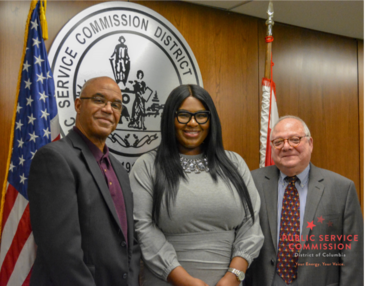 Each year, the DCPSC assesses electric, natural gas and telecommunications providers in the District for our operating budget and to monitor the level of competition in the District. The DCPSC requires each provider to complete an annual survey and provide a notarized affidavit to assure the accuracy of the reported information. This year, annual survey responses are due to be filed with the Commission Secretary’s office no later than April 1, 2019. Online versions of the response forms for Electric, Natural Gas, and Telecommunications suppliers can be found on the DCPSC website. The DCPSC strongly encourages all suppliers to file responses via eDocket, our online docket management system available to the public for filing documents with the DCPSC. You can obtain an eDocket profile by submitting a request here. If you require assistance, please call 202-626-5150 or submit an email to psc-commissionsecretary@dc.gov. 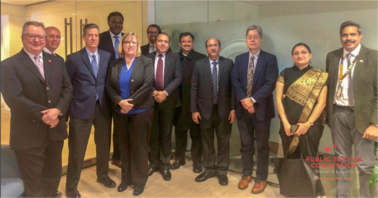 The DCPSC was invited by National Association of Regulatory Commissioners (NARUC) to offer experience and expertise on key renewable energy issues to a delegation of senior management officials of the Indian Ministry of New and Renewable Energy at the Roundtable on Renewable Energy and Regulation in the U.S.
DCPSC staff presented an overview of regulatory initiatives for renewable energy programs in the District of Columbia. Staff from the District’s Department of Energy and the Environment (DOEE) and the Federal Energy Regulatory Commission (FERC) provided presentations also. The roundtable was co-sponsored by the U.S. Agency for International Development (USAID). The DCPSC is proud to support NARUC's efforts to provide tools and resources to the international regulatory community. DCPSC staff visited DC Water to view their electric generating system that derives its fuel from the wastewater that is being processed at the site. The system converts the collected sewage into methane, which is then used to power gas turbines—with a capacity of about 14 megawatts—for the production of electricity used on site and recoverable heat. This generating system is also considered to be a renewable energy facility that helps meet the District’s renewable energy portfolio standard. DC Water next steps are to install solar panels at its facility in Southwest D.C. Throughout the month of March, the DCPSC is celebrating Women's History Month and International Women's Day (March 8th) by recognizing the achievements of women on our social media platforms. 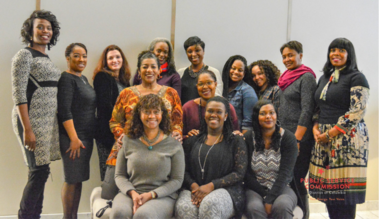 The DCPSC recognizes the women of the DCPSC for their dedication in serving D.C. residents, and we support and celebrate the social, economic, cultural and political achievements of women around the world. The mission of the Public Service Commission of the District of Columbia is to serve the public interest by ensuring that financially healthy electric, natural gas and telecommunications companies provide safe, reliable and quality utility services at reasonable rates for District of Columbia residential, business and government customers.